With all of the technology in today's world, there is still nothing that can replace the utility of a wheelbarrow. Whether you are gardening or doing major landscaping, having the right tool for the job is important. Finding the right style of the wheelbarrow for you and your needs will help you get the job done with the most ease. Finding the right balance of features for your needs is important. Depending on the kinds of materials you need to haul, the storage requirements you have, the level of the terrain where you will work, and your own size and strength, you will have a lot of different kinds of considerations. Here we will talk about the different kinds of wheelbarrows available on the market. We all want a product that is worth the time, energy, and expense of getting it home. Some wheelbarrows are far easier to use and more reliable than others, and many look radically different from what we might normally think of by the word wheelbarrow, while others are still keeping close to the original concept of a wheelbarrow. You might have questions about what to look for when buying a wheelbarrow for your future projects. How many wheels do I need? What kind of wheels is best? Which handle shape is most useful? What size tray do wheelbarrows have and how much do they hold? Do I need help with steep hills? Depending on your project, different wheelbarrow styles may be better. Wheelbarrows come in a variety of designs. Some have one wheel, others have two, and some can have even four and look more like a wagon. Some are convertible to other kinds of useful equipment or have added features that make hauling materials easier. When you want to choose a wheelbarrow, you will want to think about which style best suits your needs. Styles with one wheel are usually able to turn quickly. If you are working on a project that requires this ability, that can be handy. Also, with only one wheel on the ground, you limit the amount of space that gets tamped down by the wheelbarrow to a very narrow line. Two-wheeled designs provide added stability over one-wheeled style. They do not turn corners as well, but for heavier loads, a wheelbarrow with two-wheels can help prevent fatigued arms. 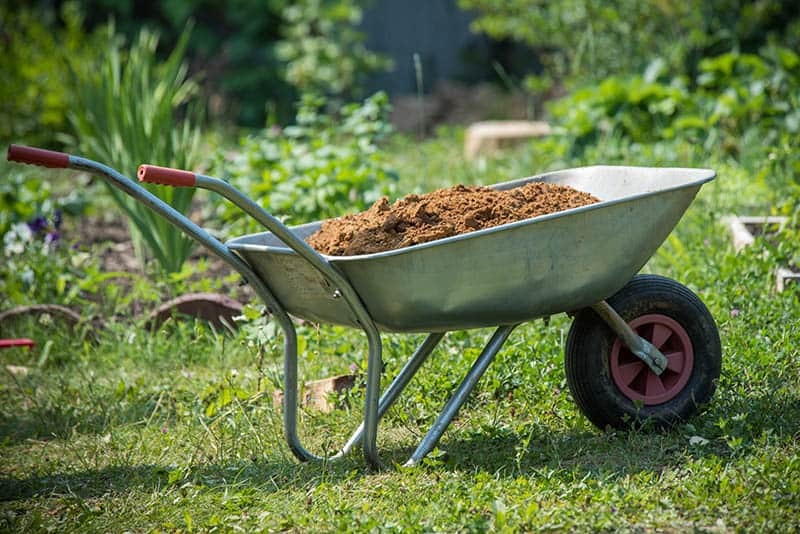 The wheelbarrow is less likely to tip to one side or the other and spill the contents--a frustration that you can avoid by having the extra wheel. Wheelbarrows can sometimes look more like a wagon. These are often called dump carts. They will have four wheels and can have a variety of handle types, some more like a wagon and some more like a bicycle. What kind of wheels do you need on your wheelbarrow? Like with the number of wheels, the type of them can be important. Manufacturers sell all different kinds of wheels. Hollow plastic ones, pneumatic wheels, flat-free ones, thicker tread wheels, and more. Plastic wheels are usually found on the lower cost wheelbarrows. These can be on heavier duty models as well. The challenge with plastic wheels is that plastic wears down over time. Wheelbarrows with plastic wheels that are left outside in the weather are not going last as long as some other wheels. Flat-free wheels are great for people who want to have rubber style tires without the worry for the need to re-inflate flat tires. Standard rubber wheels have pneumatic inflatable tires filled with air like a bicycle’s tires and may be lighter weight as a result. Some wheelbarrows even come with enormous wheels sized for bicycles. 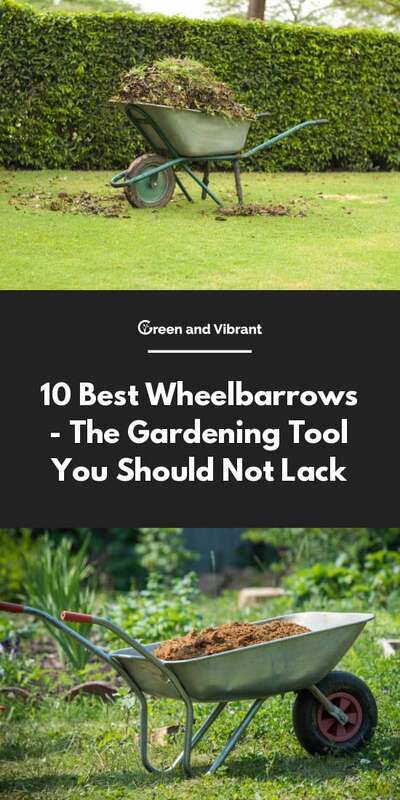 Most wheelbarrow users agree that there are benefits and drawbacks to this type of wheel. The air filling acts as a kind of cushion, enabling better maneuverability and gentler push on all kinds of terrain. The downside is that when the temperature changes, the tires can lose air, also like a standard bike tire, requiring more frequent service to keep up the air level. Wheelbarrows can also have thicker tread tires on the wheels for doing projects on uneven land. These can help you navigate rough patches of ground on your heavy duty projects. Some wheelbarrows have powered wheel technology. This allows the wheels to move under their own power, saving work for the person operating the wheelbarrow and making it easier to move a load from one location to another. These are especially helpful for use on steep slopes. Metal trays on wheelbarrows have been the standard for most of wheelbarrow history. Different kinds of metals can be used, and these can be painted or not. Metal trays are hard and sturdy and function well in all weather, but they can also be prone to rust. Metal can also be challenging in very hot and very cold weather. Touching a hot metal part on a wheelbarrow can cause burns, and moisture on freezing cold metal trays can cause ice to form and provide other challenges as a result. Painted metal trays do not have the same problems as exposed metal trays in wheelbarrows, and they look pretty, but over time the paint can chip away with use and mix with whatever load you are carrying and expose the metal to rust. Metal wheelbarrows are the kind most often used for things like mixing concrete for pouring small slabs and making repairs to existing concrete. Plastic wheelbarrow trays are usually bulkier than metal ones. They have to be able to hold the weight of heavy loads. Plastic trays are often deeper than metal trays, and typically these will have two or four wheels rather than the old standard single wheel styles, often with a very wide turning radius. Like with plastic wheels, however, plastic wheelbarrow trays are prone to damage from the weather. Intense heat and cold and direct sunlight will weaken the bonds in the plastic over time, and some loads can even chip off pieces some of the strong plastic. A plastic wheelbarrow does not generally last as long as a metal one. Fabric trays are a less common style for a wheelbarrow. These are seen in some four-wheel wagon-style barrows and even in collapsible wheelbarrows for more compact storage. Some wheelbarrows have a dump tray option. This makes it so that you can tip the tray up to dump the load while the wheels stay on the ground. Some models also come with tray coverings to help keep materials in and weather out. The shape of the handle for the wheelbarrow is another important consideration. Different types of handles can feel more comfortable depending on your project. The standard wheelbarrow has two protruding rods with hand grips on the ends. The user stands behind the wheelbarrow, grips the handles, and pushes forward. Many models use a loop-shaped handle. This can feel more comfortable to push, and in some models, you can even pull the wheelbarrow, such as with wagon style versions. Less common models even offer hand brakes for people who are hauling loads on steep surfaces, and some have optional controls for more options, such as powered wheels. Some can even be attached to vehicles with a tow hitch to be hauled around on a work site. Wheelbarrows come in a great variety of sizes. When you plan to buy a wheelbarrow, think about how many trips you will take moving loads around and what will make sense for your project. You may also want to think about future project needs that may be different than your current needs. This Jackson brand large capacity wheelbarrow is a standard form of a wheelbarrow. Its wood handles hold a heavy duty seamless steel tray and frame which in this contractor model are painted, protecting the metal from the elements and therefore from causing damage to the metalwork. The single air-filled wheel at the front is framed by a metal stabilizing brace, making it simpler for you to tip the load forward to empty the tray, which holds 6 cubic feet of material per load. The sixty inch long handles are made of heavy duty wood, and the wheel has an extra large 16-inch pneumatic tubed tire. The product dimensions are 36 in x 25.5 in x 27 in. This is a small sized wheelbarrow that is designed for children ages 3 and up made to look like a standard, traditional wheelbarrow but built to serve a younger population. Kids can help out with doing the yard work and heavy hauling with their own pint-sized versions of real wheelbarrows. This model is a fully functional design as a wheelbarrow and has a seamless steel tray with smooth edges designed to keep little fingers safe from sharp edges, helping parents and children alike to feel safe when young ones participate in outdoor chores—or simply play around the yard in their own construction games. The handles are made of real wood, and the base has a durably molded plastic wheel that makes steering easy in any direction. The product dimensions are 31.10 in x 16.26 in x 11/34 in, and the weight capacity is 25 lbs. The moderately sized Worx Aerocart was designed for those who need a multi-functional piece of gardening equipment that will do many jobs besides in the garden, but that will not take up more storage space. This wheelbarrow can also function as an appliance dolly, a flower pot mover, a bag holder, and a cylinder carrier. The beauty of this ingenious product is that you can purchase a single product that can tackle a whole host of home and garden challenges without adding the expense of purchasing a slew of additional products to get such varied projects done. From moving house to landscaping with small trees to hauling rocks and lumber, this tough gadget is a powerhouse. The comfortable, carefully balanced design of the chassis makes using it as a wheelbarrow simple, and it even has fold-out extension arms that can be used to lift heavy items levelly, such as potted plants and trees, mulch bags, and more. The dolly motion can transport loads up to 300 lbs, and the wheelbarrow can move loads up to 200 lbs while making them feel like no more than 17 lbs. It has a tray capacity of 3 cubic feet and converts between modes without the need for any tools. Several accessories for this multi-functional wheelbarrow are included, among them a flower pot strap, a cylinder holder, a bag holder, and a mesh rock mover. The product itself is heavy at 49 lbs. The moderately sized Simplay3 Easy Haul plastic wheelbarrow is a heavy duty plastic wheelbarrow that has large, loop-shaped handles for a more comfortable grip. Unlike some other wheelbarrows that have only a portion of their materials made of plastic, this one is almost entirely made of rigid plastic, including the handle and the tray which are combined. While plastic equipment is less prone to causing harm to the user in very hot or very cold conditions, it is also much more susceptible to weathering and can lose strength when exposed to weather elements for long periods of time by virtue of being made of plastic. It has a flat floor for keeping contents level during transport and a storage tray for garden tools, drinks, and whatever else you may need on hand. The two wheels are 13.5-inch roto tough treaded wheels which are designed to make it pivot and roll easily even on rougher terrain, though the wheelbarrow itself has a fairly low stature. Product dimensions are 46.2 in x 31.2 in x 23 in. It weighs just under 24 lbs. This large capacity dual wheel model cart has a loop-shaped, padded metal handlebar on this wheelbarrow doubles as a stand when the unit is not in use. The tray framework chassis is made of powder-coated steel, and the tray itself is made of hard polyurethane to resist rusting, though the chassis itself may lose its powder-coating and be prone to rust. The two metal elbows that brace the wheelbarrow behind each tire are known to scuff, leaving rust marks behind on ground where they touch, when they have oxidized. The wheelbarrow has a capacity of 5 cubic feet of material that it can haul per trip. The two side wheels have 13-inch high pneumatic, inflatable rubber tires. The wheelbarrow weighs only 26 lbs, so with the loop handle, it is light enough to hang on a wall, but it can hold a load of up to 330 lbs, which is more than most other wheelbarrows. The product dimensions are 36 in L x 25 in W x 20 in H.
The Yard Rover wheelbarrow is a large capacity wheelbarrow that has two large, pneumatic, air-filled wheels for easier maneuverability with metal elbows for braces behind each when not being toted so that loads remain in place while being filled. It has a large, 5 cubic foot tray with a 300 lb load capacity, making it easy to tote heavy loads of materials. The tray is made of hardened polyurethane, and the frame and handles are made of metal. The whole unit weighs 29 lbs. The wheelbarrow is lightweight enough that it can hang on a wall by its padded loop handle. Product dimensions are 35 in x 16 in x 14 in. The Gorilla Carts heavy-duty dump cart is a poly-based tray on a sturdy metal chassis with 4 wheels of pneumatic (air-filled) tires. It features a tray that can haul an impressive 1200 lb capacity; its weights spread out over the four 13 inch tires. The frame is made of steel with a black paint finish and has a small loop handle for pulling the cart like a wagon. The special D-shaped handle can also be converted into a bracket for use in towing behind a lawn tractor, golf cart, or ATV. This “wheelbarrow” is designed as a dump cart that tips up to dump the load while all wheels remain still on the ground, much like a dump truck operates, although no electronic devices are involved. The bed of the cart is large and has a ridged bottom, and tipping it back looks as though it could prove to be challenging unless the weight of the load was distributed toward the back to make tipping contents out easier. It comes with a 1-year limited warranty and is designed for use by light-duty homeowners and commercial duty professionals alike. The product weighs 58.6 lbs, and its total dimension size is 45.2 in x 25.6 in x 25.2 in. This innovative wheelbarrow includes some back-saving modern technology into a two-wheel design. It has an independent two-wheel drive system powered by a 24-volt battery unit enabling the motor to do the hard work while you simply hold onto the handle and let the wheelbarrow do the hauling. It is designed for easy turning and maneuverability, even up and down hills. The drive mechanism is controlled by a switch on the right of the two-rod handles, each of which has padded end grips for a more comfortable and secure hold. The push buttons have options to control both forward and backward movement at the press of a button, while the user holds the back of the wheelbarrow like a standard two-wheel unit. The tray is a poly tub capable of holding 6 cubic feet of material and has a hauling capacity of up to 200 lbs. Tires are 13 inches high and are connected to a rugged steel frame. The powered system is designed to help you push loads up and down steep slopes even as much as a 15-degree incline. It runs on a twin 12V-battery unit, and the charger is included. The product dimensions are 57 in L x 28 in W x 27 in H.
After a careful review of these widely varying wheelbarrow products, we can easily see that each has its benefit depending on the target population being served. Some have the benefit of ease of use by younger and smaller people, while others are designed well for hauling heavier loads or across longer distances. The wheelbarrow that reviews best for most people, when you look at all of the features of handles, ease of use, and carrying capacity, is the Decko 24V Power Assist Wheelbarrow. So many of the people who spend time gardening are those who are not especially strong. The power assist feature is helpful for anyone, petite, young, elderly, or simply looking to make a difficult task simpler to accomplish. The 200 lb hauling capacity, combined with the forward and reverse options, make it a very versatile model that can be used on a variety of landscapes. Having a battery that will work for projects lasting all day is great, even if the charge may not hold long term over many months between uses. 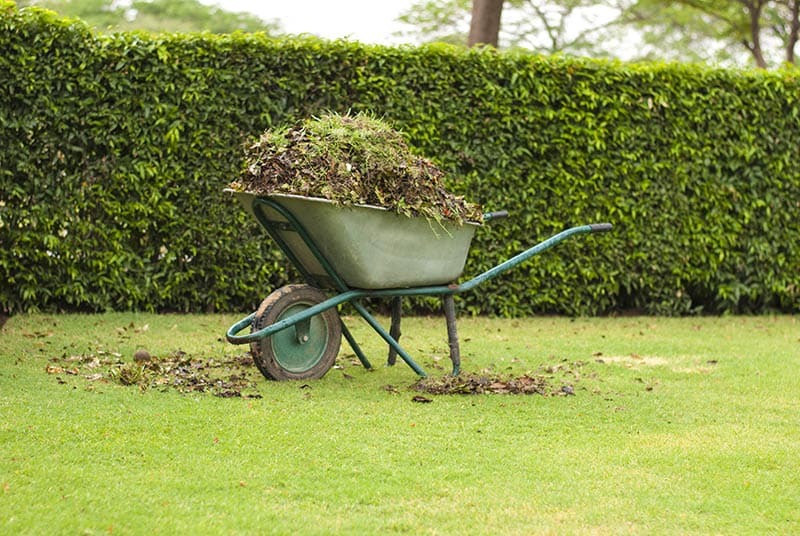 Most projects requiring a wheelbarrow will have enough time to charge up the battery before beginning the work, and saving a great deal of backbreaking effort to tote materials up and down slopes and across yards could easily save you even more money in doctor’s bills from a sore back! If you need to haul things around your property, the clear option for most people is the Deck 24V Power Assist Wheelbarrow.